A full day of driving on tarred and unmarried lay in front if us as we set out after a rowdy night for the hyenas which kept us awake trough the right. We have slept a little, but barking/howling hyenas next to your tent tend to make me nervous and not fall asleep. As yesterday was such a success, animal wise, we were hoping for the best for today. And we got more than we bargained for! We arranged a night drive for today when checking in but did not pay for it yet, so we told the staff we would be at the reception this morning to make that payment. Which meant we would have to drive in the park before opening of the reception and go back somewhere in the morning. Which we fully intended to, but were hindered in when driving back. We went to Hluhlue this morning to get a quick view of what was happening over there and were on our way back when we encountered our very first Elephant! It stood right next to the road and was quite invisible to oncoming traffic, as the first two cars just drove by without spotting it. We turned around to get to a respectable distance and about some pictures. The elephant was quite gentle at first, but as the crowd grew, so did the temper of the animal. When the time arrived that we wanted to leave, a ranger passing by tried to get by the elephant. Not to its liking. It turned around, got on the road and started flapping its ears at the white van. We think it was not amused. 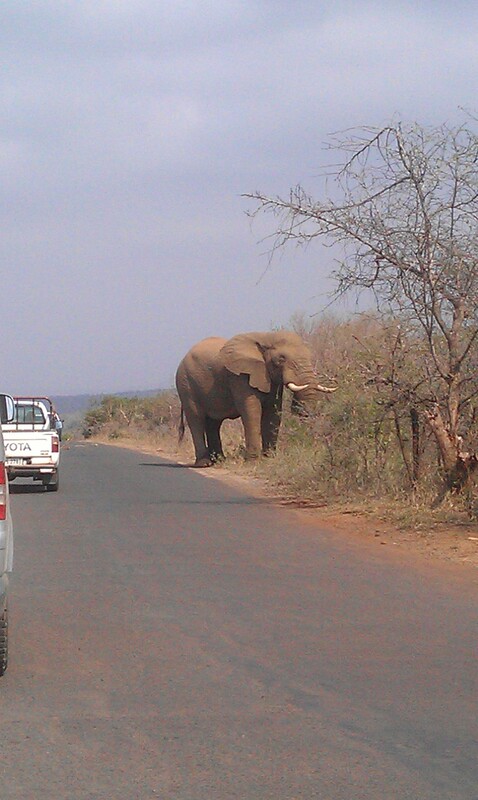 So, we stood there for some time, until the elephant decided to move forward and go eat tree nearby. And started moving in our direction. Still flapping its ears and making moves at the rangers car. We did survive however, as the ranger eventually scared off the animal by revving his car and making quite a noise leaving just enough room in the road for the cars to pass. Next Next post: To Swaziland!